Well everyone, the first annual Lemon City Live Fantasy Football draft is officially in the books! As usual, there was teams who were auto drafted smh! The chatroom was LIT and entertaining to say the least. Trash talking, excitement, frustration and Jay Cutler talk. For us that live in Miami, it was pretty much like a typical day minus the cuban coffee. Mike had the pleasure of having his team be auto drafted and for the most part, it turned out pretty good. Landed the #1 overall RB in David Johnson, #1 overall TE in Gronk and #2 QB in Aaron Rodgers who surprisingly dropped into the 5th round! The starting lineup seems to be strong but the bench lacks depth. The bench is screaming out for attention more than Instagram models who only post selfies. Keep winning on the pitch, not so sure about this team though. North Philly Buckwildzzzzz jumped out to a solid draft going with Le’Veon Bell and Dez-pacito Bryant to start the draft. Even though I’m not a fan of drafting two quarterbacks, I have Cousins & Wilson in my Top 10 QB’s so picking up both was a strong play. I like the starting lineup even though I’m not big on Lamar Miller’s upside. The bench has hopefuls in Bernard who should split carries to start season with Mixon, Ebron could lead team in RZ targets, Duke Johnson Jr who is projected to catch over 40 passes from the backfield & Amendola who will see more volume with the Edelman injury. Magic City Falafel Makers took the rookie RB approach going with Christian McCaffrey and Joe Mixon. My fear for McCaffrey is goal line work going to Jonathan Stewart and unless Joe Mixon gets full workload, won’t see his true upside while splitting carries with Bernard and Jeremy Hill. T.Y. Hilton is a gamble due to Luck’s injury and Hilton not having Luck is like Martin not having Regina. 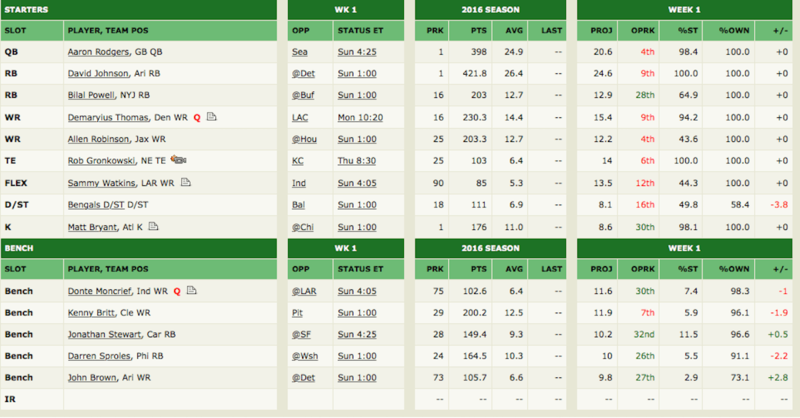 Honestly, aside from Antonio Brown, nothing really stands out to me about this team. Limetown started off the draft going with Mccoy over Julio Jones & OBJ which surprised me. Picked up Fournette which is either going to be a boom due to volume and opportunity or a bust because of injuries and a poor offensive line. Alshon Jeffrey as WR1 is a little hard to look at and Kelvin Benjamin looks to bounce back this year. This could be one of those teams that looks slightly above average on paper but exceeds expectations and finishes well. Let Me Seadem TD’s team was selected by another computer bot. This one wasn’t as loving as Lahoud’s bot. It started off with 3 GREAT WR’s but Woodhead & Gillislee as your RB1 and RB2?! That’s criminal! The fact that the computer even selected Kevin White means someone needs to take that bot and give it a beat down like how Michael Bolton smashed the printer in Office Space. 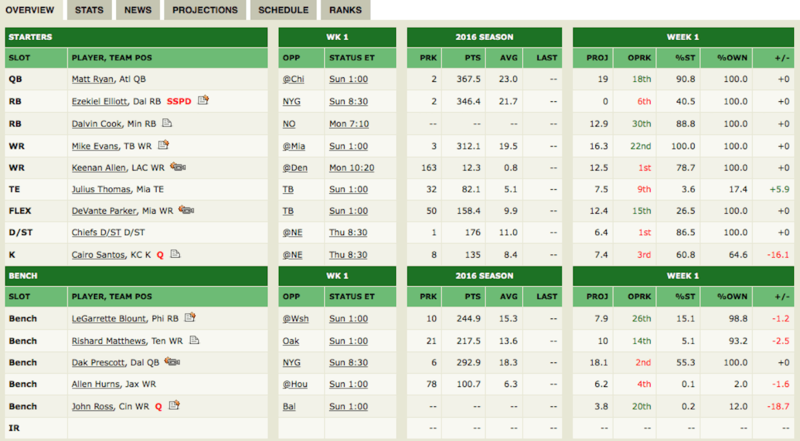 Super strong starters, horrible bench. Daffy Duke jumped out and grabbed the first QB on the board with the Tom Brady pick. 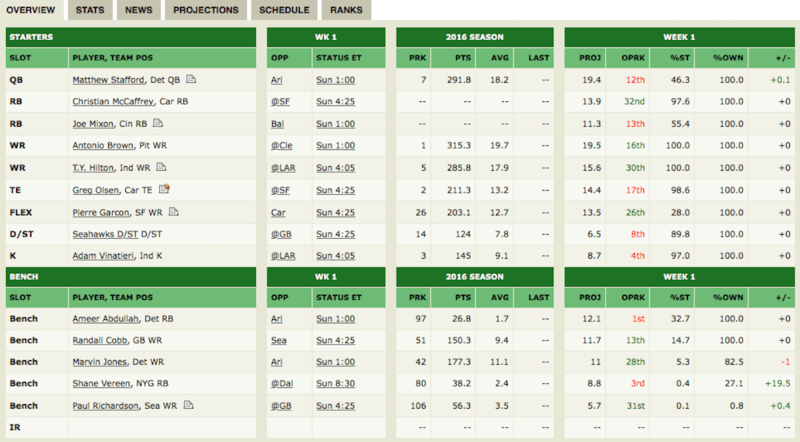 What stands out to me on this team, not in a good way, is how they only have 3 RB’s but 2 TE’s.. They went with the most popular player in the draft in Jay Cutler as their number 2 QB which created tons of buzz in the draft chatroom. 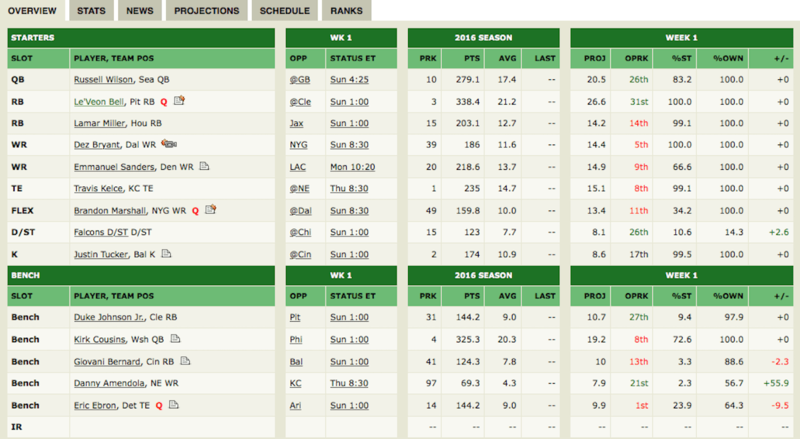 I like their starting lineup even though Hill and Tate don’t have safe floors. 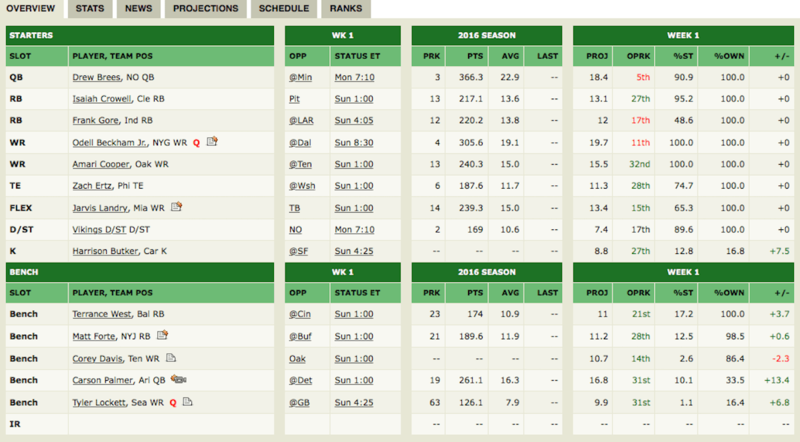 Team looks like it could have some really high weeks but also some really low ones. Hard to say whether I like the team, I want to say I do, but I’d be slightly nervous week in and week out. Rhianna’s Thickness was quick to talk trash once they selected Drew Brees. Right before the pick, two TE’s and Danny Woodhead went off the board and they were quick to let those teams know how bad that move was. Strong QB, Strong WR’s and a strong D. What I don’t like is how they have two of the oldest RB’s in the NFL with Forte and Gore. If Crowell can produce at his ADP value and they are able to pick up another solid RB throughout the offseason, this could very well could be a team that is a lock for the fantasy playoffs. 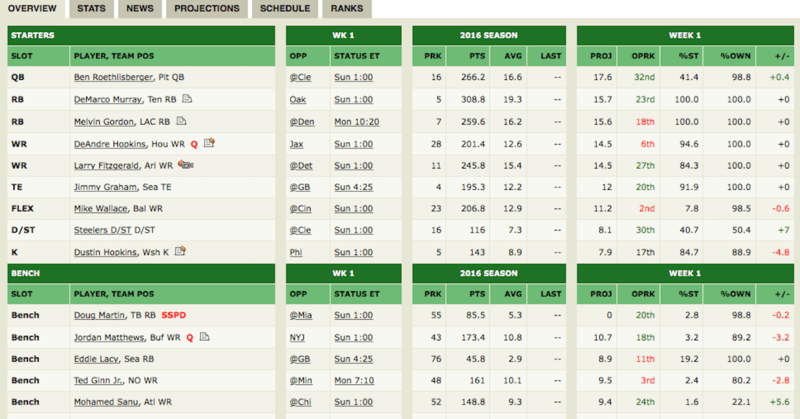 Mariota Cart, my team, started off with 2 WR’s even though I had planned to go with Zeke as my second pick. The one slight regret I have was selecting Snead over Allen Robinson but my thought was Brees throwing the ball > Bortles throwing the ball. If Zeke gets the full 6 game suspension, I like my top 3 RB’s. I’m not big on spending high picks on TE and Witten is often a Giants killer and that’s their week 1 matchup so I purposely waited late to get him. 3 strong WR’s, my highest rated rookie RB and McFadden for 6 games AND Hyde should surprise people now being in a Shannahan style offense makes me feel all warm inside. Tabien Tabien was the one who took the shot on Ezekiel Elliot despite possibility of his suspension with their first pick in the second round! A bold pick ( which I like ) but what was questionable was not going after RB’s for depth considering Zeke may miss the first 7 weeks of the season. Only other RB on the roster is Blount which reports coming out of Philly are, they may be releasing him or looking for a trade. I love the QB, Cook and the combo of Evans and Allen is great to go along with Parker. Two great QB’s and playmakers all around. Their bench is above average but they need more RB love. Team Sierra was the third team to have a robot select for them and they screwed them over by drafting Andrew Luck ( who may miss the first game and possibly more) and did NOT draft a backup QB for them. 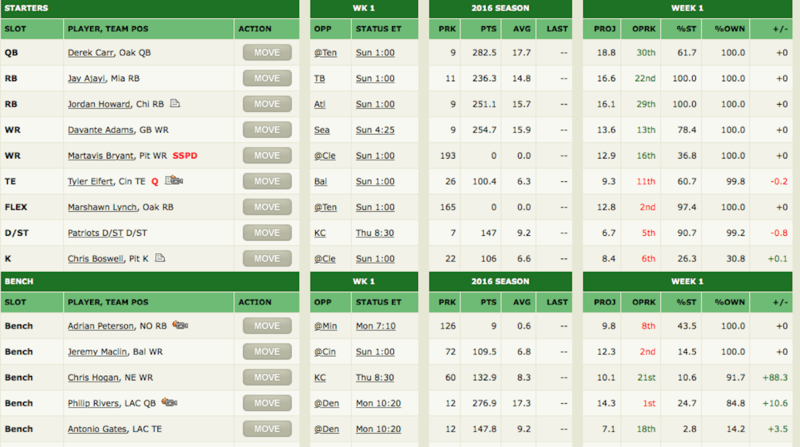 They will have to hit the waiver wire early or look to trade for a QB on teams who drafted two QB’s. This bot came through on the bench though, unlike the others. I love the Thielen, Crowder and Zay Jones selections but question the Perkins and Doctson ones. 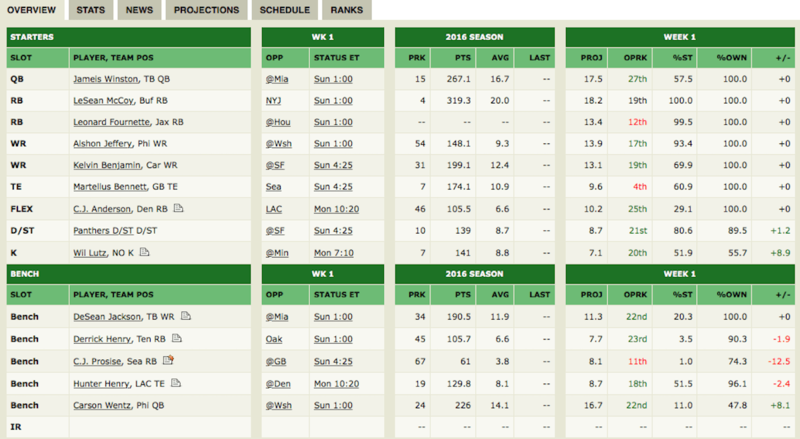 Solid starting lineup and bench isn’t perfect but it’s not too shabby. 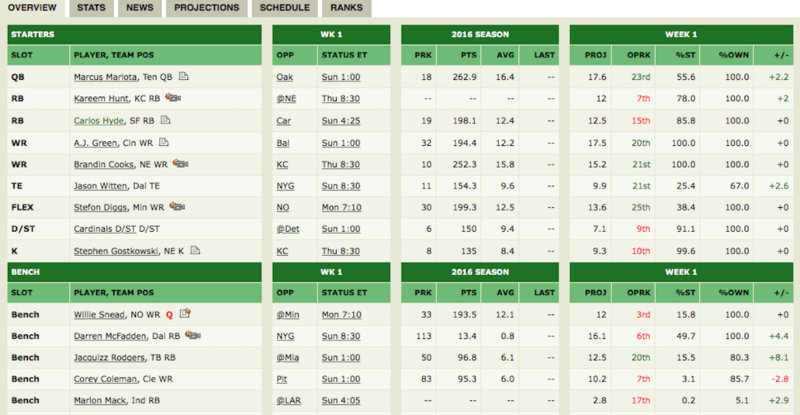 Points deducted though for the lack of team name, come on man, you’re better than this. 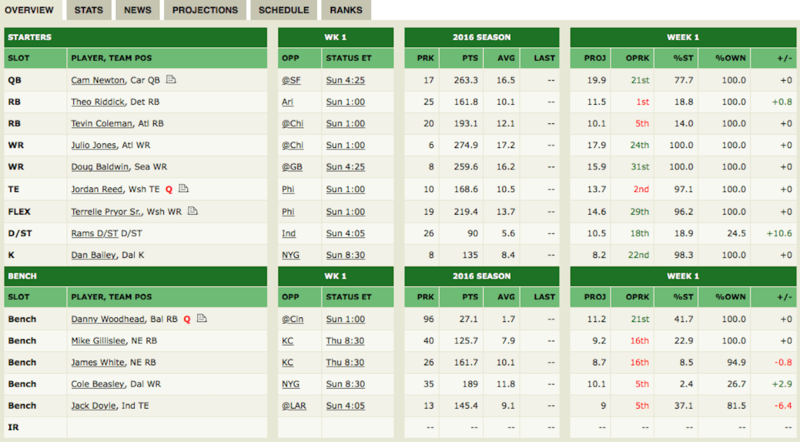 Actually, team name should be “Bye Weeks” since word on the street is they forgot to set lineups often. Not seeing him in the draft was MORE disappointing than his boy Wei-Yin Chen. 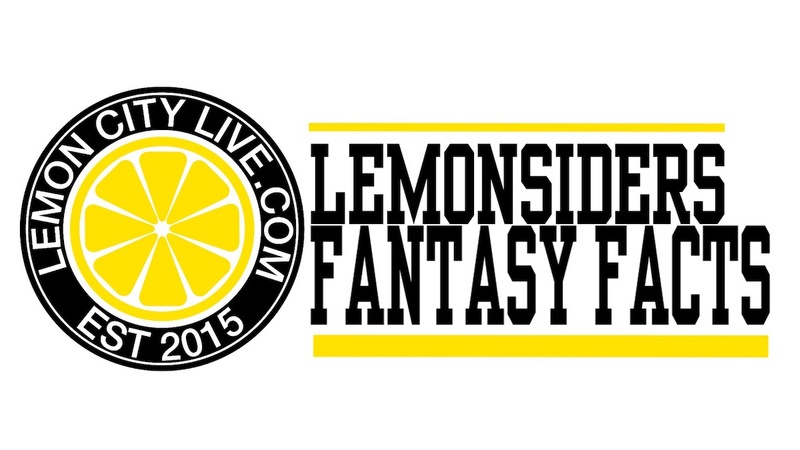 Be sure to follow the Lemon City Live Fantasy Football League throughout the year and get ready because next week the REGULAR SEASON STARTS!! Lemonsider fantasy facts will be popping off weekly so be sure to be on the lookout for weekly info on who to start, who to sit , who to cut and who to add each and every week! !